My first attempt at leading a songwriting workshop turned into a song swap and discussion about the craft rather than a writing session, which was fun in itself. Thanks all who participated! And from that workshop, I was inspired to go home and write a song called “Setting Sun (Song for a Cosmic Cowboy)”. I’ve been living in space words for the last week. No demo of the song yet, because I’m still practicing up on the fingerpicking challenge I created for myself in the intro. But I expect I’ll be playing it live somewhere sometime soon. Now I’m in a songwriting marathon… yep, looks like I’m writing another record! Today I’m pausing from finishing up “Make it to the River” to have peanut butter on a bagel and update this site. 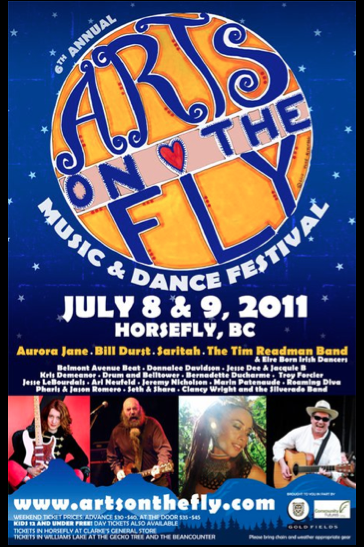 This weekend I’ll be at Arts On The Fly festival in Horsefly, BC! I will be in couple of workshops (including a songwriting workshop where we will attempt to write a new song in 60 minutes!) and will play a short set on Saturday night. I am also excited to hear music by a whole lot of fabulous artists, among them: Saritah, Aurora Jane, Drum & Bell Tower, Kris Demeanor, Jesse Dee & Jacquie B and many many more! Visit Arts on the Fly website for full line up and ticket information. See you this weekend!